When I finished the 52 Weeks of Happy project in December, I was torn. On one hand, I was sort of relieved to be through with the commitment, pleasant though it usually was. On the other, I felt slightly uneasy because I really liked both the weekly posting prompt and the necessity to stop and look for - and photograph and write about - the happy things in my life. I've been away from the project for almost three months, blogging as and when I like - a free agent, if you will. It works well for me; I never seem to run out of things to say. But I think that spending a full year looking for the happy around me helped me learn to do it habitually and I haven't stopped, even though I no longer create a weekly post around the concept. Sometimes I miss posting a short and sweet compendium of weekly happies. More than anything, I liked the intentionality of it, the mindful attention paid to happy-finding. So this week, I looked for the happy again, with deliberateness. I thought I'd share a few now - nine happy things happening this week in my home. We've been eating these teeny-tiny clementines, which I keep in a bowl on the kitchen counter. They're probably the last of the season, but they're some of the sweetest and tastiest we've had yet. It's Mini Egg season and resistance is futile, for me. I'm trying to be good, though. I find that if I count out just a few and eat them from a pretty bowl, I feel a little better about limiting myself. My dining room table is bright and cheery for spring. I'm still buying the $1.29 bunches of daffodils at Trader Joe's each week when I do the shopping. I buy three bunches and sometimes I spread them around the house, other times I prefer the whole glut of them in one jug, like now. I brought home way too many books from the library. The stack is a good representation of the types of books I like to read: lots of biography/memoir (because I'm nosy), a little fiction, some real-life essays and home decor/design. One of the backyard tulips has a bud! I think it's an old tulip planted by some previous owner of the house, not one of the bulbs I planted in the fall. It should be bright red-orange with yellow edges and black deep inside the center. Not my favorite tulip colors, but very dramatic and interesting all the same. I couldn't help it, I bought more fabric. But I do have a plan for it. These fabrics will become clothing items for a certain little girl. From the top, they are: Robert Kaufman Bento Box in Aqua, Robert Kaufman Little Kukla Floral Buttons in Retro Yellow and Riley Blake Little Matryoshka Dolls in Cream. And here's the little girl now, with her upcycled Valentine's Day M&M's container. She wanted to make it into a pencil holder. She broke off the lid and peeled the label (a tedious chore if I ever saw one). Then she popped in a few pencils and was ever so proud of her creation. It tends to tip over when it has pencils in it, but she props it against some other things and it works great. This guy's handwriting has improved greatly in the past few months and I can read just about anything he writes now. This was not the case before and it was frustrating for him and for us. Here, he is ignoring my request that he work at the table, but all of the fractions exercises were correct and they were all quite legible, so I guess it's okay. I crocheted outdoors for the first time since last October. It was lovely to sit on the patio with my tea and my yarn, hooking away while the small Bears kicked a soccer ball nearby. Idyllic spring afternoons are here! Happy, happy. I'm having lots of trouble with Google Friend Connect these days and have started using Bloglovin to read blogs. I'm in the process of moving them over, which is taking awhile. If you're also having trouble with GFC, feel free to follow me at Bloglovin, Feedly or any of the other feed readers out there. I've got buttons at the top of my blog for Bloglovin, Feedly, RSS and also a follow-by-email option. If you're already signed up with GFC and it's working well for you, that's fine too. As for me, I can't even log into GFC or manage my blog list. I really like Bloglovin though; I wish I'd given it a chance sooner. I realized I hadn't "claimed" my blog for display on my Bloglovin profile, so I'm doing it now by displaying the link below in a blog post, as per Bloglovin's instructions. Well your " happys" have made me happy too. Loving the crochet... Especially that splash of green. Oh your nine are absolutely delightful and they make me happy too. I agree with you, when we focus on the good in our lives and live a life with a grateful heart it changes our outlook on the world. It really becomes a habit and life is just so much brighter! They are building a Trader Joe's not far from our house-I have never been to one, but everyone seems very excited-I hope I can some pretty flowers too. We're eating those mini clementines too - yum! I like Bloglovin too, I've used it since Google reader was stopped. Such lovely things making you happy. I'm a sucker for those mini eggs too, a couple is never enough though, they're so moreish. I think boys more than girls struggle with their handwriting, I wonder why that is. Your second photo catched my eye, this plate is so beautiful!!! We love clementines too, there are a lot of them in the little grove behind the country house. Wish you a lovely week end and a good start in to the new week! 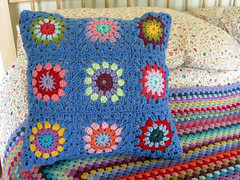 Now if only the weather would clear up around here I would also be crocheting outside. Love your happy photos. I think it's a good idea for all of us to find the happy in our daily lives. Good point. Beautiful photos - especially the clementine oranges which I love too! And fortunately for me, hubby won't touch them so they are all mine! It's so much fun to see kids blossom out and develop better skills, like writing clearly and creating useful items from discarded things! I think the Google issues are making their rounds. I had a horrible week with no one able to post a comment and slow loading of all blogs. I think it will eventually go away for you. That's what seems to happen - as it did for me! After doing a little research I see that this Google thing is a widespread problem. No one can follow me either through GFC and I am unable to follow others. You are not alone in this! I miss the happy prompt too. I have enjoyed looking reading and looking at your happies. As for Mini Eggs....I cannot allow myself to buy them. Now I want to crochet outside too! I enjoyed your happy nine.-very lovely! We enjoyed some sweet clementines a while back. They're so delicious. I think your fabric is lovely, I especially like the sushi one. Very cute. :) I too have been having problems with GFC. I'm not getting recent posts from blogs that I follow. I have to actually click on pages and then I see an updated post.- It's been a little annoying. I hope you and your family have a wonderful weekend. A lovely set of happiness. The daffodil bunch makes a difference to the world! I must get me a bunch when I get out! So far my blog is working fine, I am not involved in that Good + stuff, not sure about all of that. Love your reasons to be happy, I think doing a post about this whenever you want would be perfect. No stress or obligation, just writing it because you feel like it. Happy Happies Jennifer - lovely pics - and I love the cute fabrics you've bought for that certain little girl, I'm sure she'll be very happy with the new shapes they take on! Look at all of those happy's! I love that it comes so natural to you now to look for the happy things. Beautiful. You are an inspiration Jennifer, and I love you happy things. After a week which included a few downers, I get quite a lift looking at your pretties: the clementines, the daffodils, the cute material for the little girl bear - love it all! Another lovely post. My daffodils survived the last freeze and snow and I can happily say they are blooming. Jennifer you have a real talent for taking lovely photos! Lots of lovely things today. I know what you mean about regular posting, I started off doing a Ladybird Tuesday post but that has drifted off. I dont always have time to do it. I am happy that you had a happy week! So many happy moments from your week, Its alway nice to see. 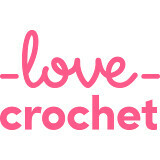 Love the colors in your newest crochet creation. I am having trouble with Google Friend connect too ~ may try Bloglovin again I too need to claim my blog couldn't figure out how to do it there. Creating my Reasons to be Cheerful posts early in my blogging experience was good for me, in helping me be recognize joy...sometimes in strange circumstances :) I miss the discipline of it, but suspect my current posts are more positive as a result of the discipline. I just tried to follow a new to me blog today and had a bit of a fuss doing it. Maybe I am not alone. The technical part of blogging continues to be challenging for me, although my daughters keep telling me I know more about the process than they do...really?????? Gorgeous happys! And now I'm craving clementines and mini eggs! The ripple afghan is one I have had my eye on for awhile. 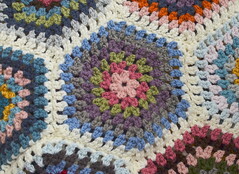 I just finished Granny Stripe and have started Granny Patchwork. Maybe ripple will be my third Attic24 blanket. Yours looks delightful.